This Sonny and Cher Costume Set will have you dressing up as this iconic hippie musical couple from the 1970s! This pop star duo is best known for their smash hit "I got you babe" making this the perfect couples music costume! Sonny Costume includes vest, shirt, and pants. Cher costume features pants, top, and choker. 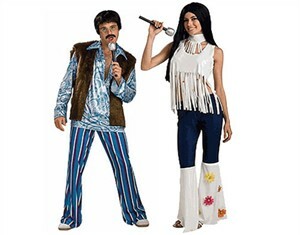 Availability: This Sonny and Cher costume usually ships in approximately 1 business day.